Fly fishing in the salt brings to my mind brassy hot, blue water, a searing white horizon, and sailfish, bones, and tarpon. 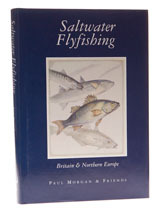 Paul Morgan turns the territory on its head and starts much closer to home with this wonderful book about saltwater fishing around the UK. The fish here are flounders, pollack, garfish, cod and mackerel. Oh, and sea-trout, salmon, sharks and other stuff like that. It is as if Paul and his mates sat down and worked out all the most unlikely species a fisherman could want to catch on a fly; and, over a whisky or three, divvied them out. Martin James must have drawn the short straw, 'cos he got the flounder, and no amount of deathless prose can make a fighting flattie sound exciting. A high proportion of fishing manuals these days are written to a kind of join-the-dots-and-catch-a-big-fish formula, but not this one. If Saltwater Flyfishing has a fault, it is in the rather light edit it has received, which results in considerable overlap between the different authors. Some subjects go the full nine yards, others are barely touched upon. Overall, there is nothing quite like it - I think I will have to read it again.